“This is Home” is an Off/Page Project documentary about the experiences of residents in Richmond, Calif.'s dilapidated public housing complexes. 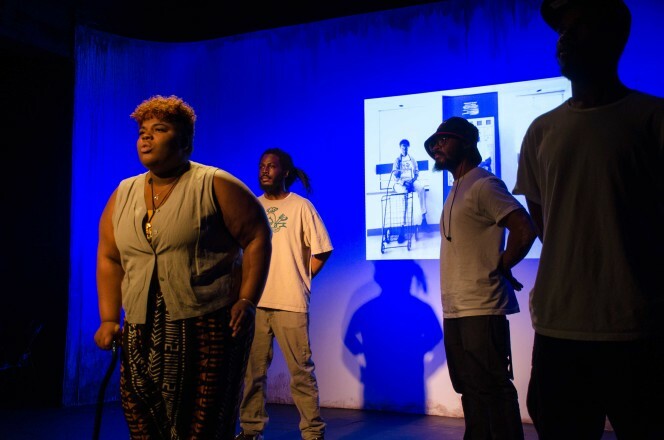 Nearly a year ago, The Off/Page Project began a radical new experiment for investigative journalism: We paired three young poets from Richmond, California, with reporter Amy Julia Harris as she investigated decrepit conditions in the city’s public housing. When we began filming, we weren’t sure what to expect. But in the following weeks, the film would become a part of The Center for Investigative Reporting’s investigation with KQED and the San Francisco Chronicle, and would be featured in a profile on the PBS NewsHour. In addition to all these things, we had no idea we’d be extending our creative work into an original one-act play for StoryWorks, CIR’s collaboration with Tides Theatre in San Francisco. Sourced from Harris’ Subsidized Squalor investigation and the poets’ own observations last year interviewing sources and walking through dilapidated buildings, the live performance at Tides analyzed the concept of “home” through the eyes of Richmond residents living – and surviving – amid atrocious conditions in the Hacienda and Nevin housing projects. Under the direction of StoryWorks Artistic Director Jennifer Welch and myself, “This is Home: The Play” allowed us to go even deeper into the experiences of elderly and disabled public housing residents through fictional characters inspired by real-life events. Evans played an ambivalent security guard, and Clark brought the Hacienda complex itself to life through an opening monologue from the perspective of the building. We even incorporated a fourth poet and actor, Tassiana Willis, who joined Clark, Evans and Hartfield-Peoples on stage as a character inspired by 81-year-old Hacienda resident Helen “Mama” Hall, who was featured in CIR’s reporting. New scenes were written as new aspects of the investigation unfolded. CIR’s Harris often was present for rehearsals, providing live feedback to our ideas. “This Is Home” became a creative project that functioned on a journalist’s deadline. Dozens of residents still live in the Hacienda complex, which was deemed uninhabitable by the city of Richmond in the wake of CIR’s investigation. In conjunction with the latest StoryWorks production, “Alicia’s Miracle,” a play written by Octavio Solis that debuted at Tides last week, the Off/Page Project is publishing the full-length theatrical film of our performance online. We hope this film continues to shine a light on this critical investigation and help expose the ongoing plight of our community’s more vulnerable populations.